bartlett mitchell has today announced the launch of its first formalised Corporate, Social and Environmental Responsibility (CSER) report – outlining comprehensive targets for 2017, as well as recognising significant achievements made in the last year. The report, titled ‘Fruitful World’, focuses on ‘Planet, People and Profit’- the company’s three pillars of CSER which are aligned to the Sustainable Restaurant Association’s sustainability framework. The strategy is centred on business growth, a reduced environmental footprint and increasing positive social impacts. 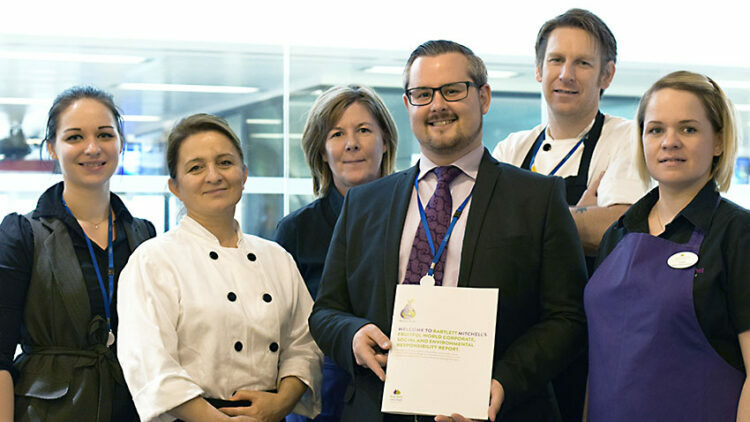 A 17.5 per cent reduction in food waste, achieved through initiatives such as WAST-edchefs workshops. Reduced deliveries to sites by almost 20 per cent through the creation of ‘Free Wheeling’ – a campaign which empowers contract managers to manage their own deliveries directly, with the aim of picking one day a week where no supplier deliveries are received. The provision of more than 12,000 training events for its 800 team members over the course of the year – helping the company achieve its ‘Investors in People Gold Award’. The sponsorship of water pumps in Malawi which has provided access to water for 5,000 people. The company worked with Thirsty Planet to build 43 water pumps, funded through the sale of bottled water at its locations. In 2017, the company aims to build on its existing achievements, using the report as a benchmark for growth. As part of it’s strategy, bartlett mitchell has set new targets focussing on increasing the use of Perkee, its fairtrade coffee; adopting more beehives from the British Beekeepers Association to support research into honey bee health with the aim of reducing the decline in nature’s natural pollinators; and building on their activity around the use of sustainable packaging such as paper cups. bartlett mitchell’s executive chairman, Wendy Bartlett MBE, says: “Whilst we have been reporting on all CSER our activities separately for many years, we are delighted to launch our first-ever comprehensive CSER report. As a progressive business, CSER is embedded within our day-to-day activity but this report helps us highlight some of the brilliant work our teams have undertaken over the last year, as well as giving us defined targets to meet for the coming year. “Our ‘Fruitful World’ report sets ambitious targets which means we are constantly looking at new ways to partner with other businesses, our teams and wider society. “Our target is to help drive change and development and, by working closely with our teams and customers, we hope to act as an enabler for the growth of our clients’ businesses”. bartlett mitchell’s CSER report 2016/17 from bartlett mitchell on Vimeo.